This is a great strategy game in which you will have to save your outer space base. The ships will be heading for the core and will try to destroy it. You have to place turrets in their path so they will not reach it. Make sure you upgrade your turrets to be more powerful and take down the enemy ships. There will be lots of cores you need to defend and the enemies will start coming in more numbers. For each kill you will get you will receive some money and you can build more turrets with them. 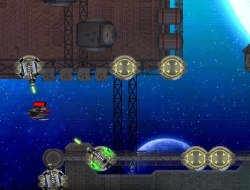 Later on in the game you will get to build different turrets and eventually you will defeat all of them. Star Base Defense 0.00 between 0 and 10 based on 0 votes.